Joy Bauer is best known for her appearances on the Today Show as their resident nutrition expert. She is also the author of seven books on food and nutrition, including two New York Times bestsellers. In her most recent book, Joy Bauer’s Food Cures, she provides readers with information on how eating the right foods can improve your health. Each chapter of the book offers information about a particular health concern and what foods you should eat to treat the condition. She outlines how certain foods can keep you healthy as well as those that may potentially exacerbate your health issue. Advice is also provided on additional activities, nutritional supplements and lifestyle changes that may be beneficial. For example, to assist with the management of cardiovascular disease you can try yoga and meditation. You may also consider supplementation with coenzyme Q10. At the end of each chapter there is a meal plan based on the foods that are good sources of key nutrients to help your condition. All of the meal plans provide between 1200 and 1500 calories a day. Breakfast meals range from 300 to 400 calories, lunches are approximately 400 calories and dinner around 500 calories.The meal plans were created to suit those with lower calorie requirements. Dieters who need more calories are given instructions on how to add 100 calories to each meal. You can also choose from the list of acceptable snacks and have a glass of wine with dinner if you have some calories to spare. Skinless turkey, chicken breast, seafood, lean beef, egg whites, low-fat yogurt, low-fat milk, garbanzo beans, black beans, lentils, tofu, tempeh, soy milk, whole-grain bread, whole-grain pasta, quinoa, oat bran, sweet potatoes, oranges, apples, mangoes, berries, broccoli, avocado, peanut butter, walnuts, flaxseed, olive oil, dark chocolate. The following is an example of the meal plan for prevention of cardiovascular disease. Regular physical activity is encouraged in Food Cures because it can help with weight loss as well as improve a variety of health conditions. The amount and type of exercise recommended varies for each specific health concern. 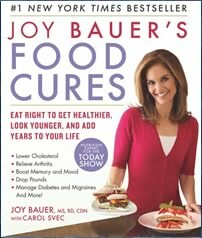 Joy Bauer’s Food Cures: Eat Right to Get Healthier, Look Younger, and Add Years to Your Life retails at $21.99. Contains meal plans, grocery lists and recipes for each health concern. A specific plan for weight loss is provided. Presents examples of patient success stories. Includes a section on decoding nutrition labels. Some of the recipes contain unhealthy ingredients such as margarine and artificial sweeteners. The book is very large and may be overwhelming for some readers. Some of the information is repetitive. Certain individuals will require more precise guidance to effectively manage their health conditions. Joy Bauer’s Food Cures will appeal to readers who enjoy learning about how food choices can assist in the prevention and management of specific health conditions. It includes nutritional and lifestyle advice as well as detailed meal plans designed to improve a variety of health concerns.